King County's Wastewater Treatment Division will be installing a new pipeline in some sidewalks between Northeast 54th Street and Northeast 45th Street in Seattle. This project will take clean water from Ravenna Creek that flows into a sewer line and move it into a new pipe to 45th Northeast and into Lake Washington. The creek flows are now treated unnecessarily at King County's West Point Treatment Plant in northwest Seattle. Moving them through the new pipe to Lake Washington will reduce costs and make room within the sewer system. Ravenna Creek used to flow from Green Lake to Lake Washington through the current location of Cowen and Ravenna parks. Because of development, the creek was diverted into a sewer pipe and now exists aboveground only within Ravenna Park, where it is fed by springs and runoff. Since 1990, plans to restore the creek to the surface (called "daylighting") within the park boundaries have been in development. King County will transfer the creek into a new pipeline, and the City of Seattle will daylight a portion of the creek within Ravenna Park. Click on image for a larger view (51KB). A King County contractor will install an 18-inch pipe in the sidewalk from Northeast 54th along 24th Avenue Northeast; along Ravenna Place Northeast to the intersection with Northeast Blakely Street; and along 25th Avenue Northeast to a location just north of Northeast 45th. (See map, 51KB.) The creek will then go to an existing city storm drain and into Lake Washington. The contractor plans to work in 300-foot sections every two weeks, restoring each section before moving to the next. During construction, King County's contractor will work to preserve access to businesses. 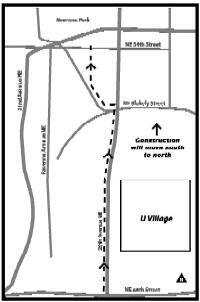 To keep traffic flowing on 25th Northeast, the contractor will install the pipeline in the sidewalk. Construction will affect street parking in the area. The contractor will avoid construction on weekends. Construction will run from this September to February 2004. Work will not take place during Huskies football games.